Problems solved, beautiful code, and the joy of programming. How things are displayed in Quick Launch menu depends on more than whether they are marked to be shown there. 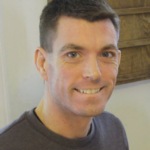 Derek Smith is a coder, IoT enthusiast, occaisional speaker, and father of 4.